Fractal’s original Arc Midi chassis impressed us enough to become the base of our CPU cooler testing rig, so when we heard that a sequel to it was released, we couldn’t wait to check it out. With its beefy feature-set, semi modular design, support for up to a 240mm radiator and a $70 price tag, this mid-tower might just be the one to beat. With all of the components running at stock frequencies, things looked right on the money, although the maximum CPU load temperature was a few degrees warmer than when we tested another one of Fractal Design’s cases, the Define R4. This trend continued when running the same load tests while overclocked. On this run, the CPU was a single degree warmer at 65ºC, while the GPU stayed steady at 93ºC. Since we run all of the case fans at 100% during testing, it gives us a good idea of just how loud a case will be. I’m happy to report that only the faint rush of air could be heard. Well, until the fan on the GPU kicked in at least. From a personal standpoint, I love Fractal Design’s cases. There’s very little flash, but loads of function, inside and out, and with the Arc Midi R2, things get even better. The inclusion of a split connector for the combo USB 3.0/2.0 ports means that your front USB ports will always be usable regardless of the configuration of your motherboard. What’s more, support for some of the largest radiators around is added to an already fantastic list of features carried on over from the original Arc Midi, which I liked so much, I chose to use it for our CPU cooler test system. The build quality is top-notch, there’s lots of flexibility with regards to hard drive configuration, tons of room to work in, enough space on the back of the motherboard tray to tuck away a ton of cables, and a built-in fan controller. What’s not to like? Despite the front panel audio cable that might be too short to cleanly run behind the motherboard in some cases, and a reset button that’s so small I could only press it using something pointy, the Arc Midi 2 is a winner in every sense of the word. For some, it all comes down to dollars and cents, and to me, this is where the Arc Midi R2 really shines. At ~$70 US, it’s an absolute steal. 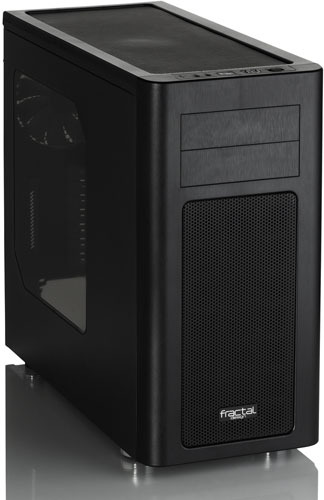 I’ve tinkered with cases that cost $100 or more, but had similar features and build quality. If you’re a budget conscious builder that would rather have more dash than flash without sacrificing quality, keep this case in mind. It goes without saying (but I’ll say it anyway) that the Fractal Design Arc Midi R2 is the proud recipient of our Editor’s Choice award!